Ibis Budget Semarang Tendean is the right choice for smart travelers willing to stay in the heart of Semarang, explore local food and experience the Javanese hospitality. Feel Welcome at ibis Budget Semarang Tendean! 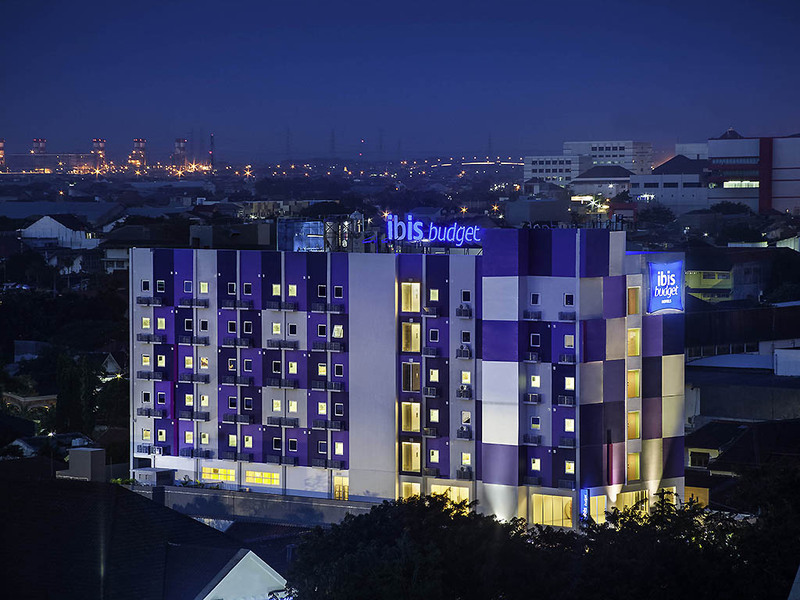 Located in the heart of Semarang and easy to reach, ibis Budget Semarang Tendean, a modern and design hotel, accommodates smart budget travelers. In the cocoon and air-conditioned rooms, all the Sweet Bed beds are equipped with soft duvets and fluffy pillows. Enjoy a spacious well-it shower, a full-length mirror, a flat screen TV with a wide choices of channels and free high-speed WIFI. The hotel offers all-you-can-eat breakfast buffet, 24-hour reception desk and parking area. Nearby Simpang Lima, the icon of Semarang, ibis Budget Semarang Tendean is an ideal choice to start enjoying the city for budget traveler. Local food area and Paragon mall are accessible within walking distance. The beautiful architecture of Masjid Agung Jawa Tengah, the beach but also discover the fresh air and the great view of Ungaran mountain. Drive one hour to explore Gedong Songo Temple, Umbul Sidomukti, Curug Lawe and Curug Benowo (hidden waterfall). Semarang is a cultural city and home of friendly Javanese people. You can explore the city with traditional pedicab (called becak), discover local food in Pasar Semawis, experience Kampung Batik Semarang to shop and learn how to make batik. Everything (but the breakfast) was excellent. The staffs are nice and helpful. It was fun trip at Semarang City. I found not only good hotel with good price but also good location too. I loved the room. It has city view, cute bathroom, comfort room to stay, soft bed, cold air conditioner, and friendly staff. I wish i can spend my holiday next time at Ibis Budget Hotel and hope can get low price again. Thank you. its find for room rate. Dear Mr. Albertus, thank you for your response. We are delighted that you were happy with your stay. We appreciate your feedback and look forward to welcoming you again in the near future. Best regards, Benjamin Castel, General Manager. Its a good choice to spend a good weekend in this Hotel. I'm pretty sure to come back for another holiday in Semarang and I Just need to stay here for a long time. Good service, clean and tidy room, and friendly workers for sure .Love! The location was good near Paragon Mall. I love the hotel because it was so fun both receptionists and all staf were really polite and beautiful. It was so amazing to stay in this hotel. I gave a full rate of ibis budget semarang. All aspects were good for me. And I would like to highlight one super support gave by ibis budget semarang is the front officer staff. They were very heplful. Nothing problems with the breakfast, everything was still in good conditions. I stay for business trip, hotel location is near to anywhere, room is small, I found bedline is dirty, looklike they didnt change it if dirty. I have my breakfast at 07.30 and find no tea, coffe, when I ask restaurant staff, she said that this hotel no tea and coffe service, but after 20 minutes, I find another staff and ask about coffe and tea, he sak me to wait and bring coffe and tea. I also found no other choice of breakfast except steam rice and fried vegetables, other menu (fried rice, eggs with chili sauce) is empty and when I ask staff, she said that all is finish, no more. my suggest for hotel management, please dont do any breakfast price with room if your hotel or staff cannot prepare it, better you sell room only, so we didnt disappointed for your breakfast service, all almost empty when I have my breakfast at 07.30. overall check in and check out process is very good, also the front desk staff very warm. Dear Boedi, thank you for your response. We are delighted that you had a nice stay with us and felt comfortable. We appreciate your feedback and look forward to welcoming you again in the near future. Best regards, Benjamin Castel, General Manager. Dear Harnoko, thank you for participating in our Guest Satisfaction Survey. We are delighted that you were very satisfied with your stay, especially with our friendly staff, good breakfast and comfortable room. We appreciate your feedback and look forward to welcoming you again in the near future. Best regards, Benjamin Castel, General Manager. The staffs are very helpful, explain everything well. check in and check out processed very quickly. I ask for hair dryer, and they respond quickly. One thing that I was not pleasant of: the bath mat. The bath mat is not so clean with some stains and gray-ish color. Very amazed with the front office staff, they are very welcome and always greet the guest with smile. When I asked for help to order me a grab, the staff was willing to help me and gave me the information about foods in semarang. I have no doubt to spend more nights in ibis budget hotel semarang when I come to semarang again. Budgeting concept for budget hotel that is reasonable for me. I am qiite surprised with the breakfast, breakfast is good, tasty and delicious. Very nice tho, the hotel location is strategic as well. Dear Harys, thank you for participating in our Guest Satisfaction Survey. We are happy to learn that you had a nice and good stay with us and were pleased with our clean room and excellent service. We appreciate your feedback and look forward to welcoming you back very soon. Yours sincerely, Benjamin Castel, General Manager. Dear Mr. Samuel, thank you for staying at ibis budget Semarang Tendean and for taking the time to share your experiences with us. We are delighted that you very satisfied with our hotel that is clean and strategic. Once again, thank you for your feedback and we look forward to welcoming you back at our hotel in the near future. Best regards, Benjamin Castel, General Manager. Very pleased having stay in ibis budget semarang. Very good for the breakfast, room, and the staff. Good brand! Dear A., thank you for participating in our Guest Satisfaction Survey. We are thrilled to read your wonderful review and to learn that you were very pleased with your stay, the breakfast, the room and our staff. We appreciate your beautiful feedback and look forward to welcoming you back very soon. Yours truly, Benjamin Castel, General Manager.